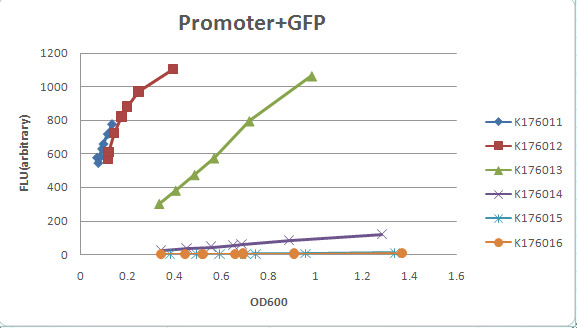 GFP gene ( I13504) , and then moniter the OD600 and GFP expression. To see the details of the model, click here please. For the details of the definition of ST.FLU and the unit ustc_st1, please click here. 1. Streak a plate of the strain which contain one of the parts listed in pSB1A3 . 2. Inoculate two 3ml cultures of supplemented M9 Medium and antibiotic( Ampicillin 0.1mg/ml) with single colony from the plate. 3. Cultures were grown in test tubes（BIO BASIC INC.12ml Polypropylene Round-bottom Culture Tubes With Graduations And Dual Cap Cat.No:TD444） for 16hrs at 37℃ with shaking at 200rpm. 4. Cultures were diluted 1:100 into 3ml fresh medium and grown for 3hrs. 5. Measure the fluorescence(SHIMDZU SPECTROFLUOROPHOTOMETER RF-5301PC, 250ul quartz cell path length 10mm,501 nm excitation,514 nm emission,1.5nm slit width) and absorbance (HITACHI UV-VIS spectrophotometer U-2810 ,200ul quartz cell,path length 10mm,600nm,1.5 nm slit width) every 30 minutes in the next 4hrs.